A 35-year friendship binds the late Chicago artist, Sabina Ott, and L.A. artist Dana Berman Duff. This exhibition, “What Does She See When She Shuts Her Eyes,” is the finale of their collaborations after Ott’s passing last year. The two artists had been constant travel companions over the years, and a trip to Iceland had been planned in preparation for this exhibition. Only Duff made it overseas, as illness kept Ott in Chicago. The loose plan was to create a collaborative piece of video work (Duff’s expertise), combined with text, sound and installation (Ott was a master of environments). The pair had chosen Iceland for its lava tubes and glacial ice caves, and the extraordinary video footage that Duff brought back is the basis for the exhibition, which she saw through to completion without her friend. “What Does She See When She Shuts Her Eyes” is poetic and mysterious — an expression of two artists contending with the human life cycle from their combined vantage points. 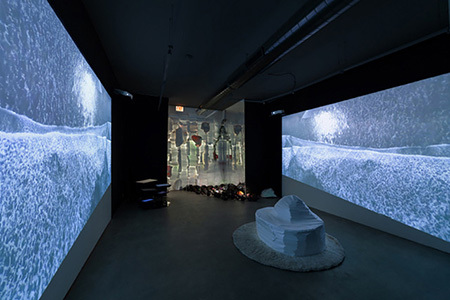 A carved styrofoam, iceberg-shaped kind of settee occupies the center of the room between the twin screens of the two-channel video. The piece opens with a view of a lava tube from the interior, a peaked pile of snow among the rocks covering the floor, seemingly formed as the precipitation fell from an opening above. On one screen, a ribbon of haiku text streams in with the light pouring through the ceiling, winding through the tube towards the viewer, then passing to the next screen, retreating into the opening on the other side. On the former screen, the camera is seemingly pressing in towards the point of origin, while the latter pulls back from the identical cavity on the other side, all set to a soundtrack reminiscent of resonant moving air. Not only does knowing the artists’ personal stories locate the content of this piece within the context of physical existence and what happens after, the haiku itself (written by Stephanie Barber) drops phrases like “astral plane,” “violence of days,” and “carve the caves of the afterlife” through the course of the poem. “What Does She See When She Shuts Her Eyes” reinforces Ott’s notion (as stated in her Ethical Will) of humans originating from and returning to water, with the end of the video piece featuring text mingling with falling snow, then trickling water, and eventually, the expanse of the sea. The work’s effect is one that is both circular and linear, ever moving towards the point of origin and away from the outlet. Punctuated by the fleeting quality of the poem, it is in effect an illustration of a temporal experience within one that doesn’t really have an end. Adjacent to the video environment are two smaller installations: a selection of 100 unique, polychromed clay orbs, or “Lava Balls,” and a six-screen assemblage of Duff’s video, entitled “The World is Round: Remembering Sabina.” Here, interspersed among video of roses, dogs and snow covered mountains is footage of Ott from various points in her life: pacing a parking lot with her cell phone and a cigarette, waving fallen branches at the camera in a lush forest. Duff explains that she often pictures her late friend “floating overhead in the sky,” and in this piece, with the six screens installed horizontally, viewers look upon them from above, as if from Ott’s metaphysical vantage point. While “The World is Round: Remembering Sabina” has sound, too, in the gallery it’s quiet, like whispers. Chicago’s art community lost a beloved and impactful figure, and in this exhibition, with Ott’s voice softly punctuating the richness of the deep and vacuous noise of “What Does She See When She Shuts Her Eyes,” Duff both brings a part of her friend into this space while also respecting the resounding emptiness that has been left behind.